Al-Qiyamah (The Resurrection) Surah 75.1-2: "I do call to witness the Resurrection Day; And I do call to witness the self-reproaching Spirit." 10. "Where is the refuge?" 11. By no means! No place of safety!" 16. Move not thy tongue concerning the (Qur'an), to make haste therewith. "5809. Here the point to be enforced is understood: . . . This appeal is made to two considerations: (1) That every act has to be accounted for, and evil must have its recompense at the Resurrection; and (2) that man's own spirit has a conscience which would reproach him of sin, if he did not suppress the inner voice. 5810. Our doctors postulate three states or stages of the development of the human soul: (1) Ammarah (12:53), which is prone to evil, and, if not checked and controlled, will lead to perdition; (2) Lawwarah, as here, which feels conscious of evil, and resists it, asks for Allah's grace and pardon after repentance and tries to amend; it hopes to reach salvation; (3) Mutma'innah (89:27), the highest stage of all, when it achieves full rest and satisfaction." For the purpose of analyzing Qur'anic subject matter, it is better to start by examining the opinion of the Qur'an about itself and its manner of self-introduction. The first and foremost thing that the Qur'an pronounces about itself is that all of its words, phrases and sentences are the infallible Word of God. It makes clear that Prophet Muhammad was not its author; rather only related whatever was revealed to him through the agency of Angel Gabriel with the permission of God. Without doubt it is the darkness of ignorance from which the Qur'an emancipates humanity and leads it towards the light of knowledge and wisdom. Thus the overriding message of this website is that Truth of the Qur'an must be upheld at all times, no matter how controversial. And what is more controversial than proving Al-Qiyamah is not what humanity has been led to believe for the last 1,400 years? The only way to prove this is to uncompromisingly defend the truth regarding the Resurrection - the heart and soul of the living, breathing Holy Qur'an - that will compel the believers of all religions to surrender and bear witness to the Will of Allah. The ever-increasingly materialistic, decadent and violent world has now reached a point of no return, and every being must submit to the Call of Resurrection and surrender to His Plan for all humankind. So here "it will be fitting to introduce the sages' defination of the term truth. It has been earlier demonstrated that without such a defination men wander in a dry wilderness of hollow fancies, unfounded opinions, worthless theories and hypostatized words. This defination may sound quite simple, but it implications are most profound. It should be graven deeply on the heart. Here it is: TRUTH is that which is beyond all contradiction and free from all doubt; which is indeed beyond the very possibility of both contradiction and doubt; beyond the changes and alternations of time and vicissitude; forever one and the same, unalterable and unaltering; universal and therefore independent of all human ideation." With that in mind we will attempt to understand this extremely important opening lines of Al Qiyamah (The Resurrection). Thus, in order to comprehend the supreme secret of surah Al-Qiyamah, the critical opening lines and the words "witness" and "self-reproaching Spirit" must be first understood. It is imperative that they are thoroughly examined and understood. witness"1 an attesting of a fact, statement, etc,; evidence; testimony 2 a person who saw, or can give a firsthand account of something 3 a person who testifies in court 4 a person called upon to observe a transaction, signature, etc, in order to testify concerning it if it is later held in question 5 something providing or serving as evidence - vt. 1 to testify to 2 to serve as evidence of 3 to act as witness of, often, in proof thereof, signing a statement that one has done so 4 to be present at, see personally." self "1 the identity, quality or essential qualities of any person or thing 2 one's own person as distinct from all others"
reproach "vt. 1 to accuse of and blame for a fault so as to make feel ashamed; rebuke; reprove 2 to bring shame and disgrace upon; be a cause of discredit to - n. 1 shame, disgrace, discredit, or blame, or source, cause, or occasion of this 2 a blaming or reproving; rebuke 3 an expression of blame or reproof 4 an object of blame, censure, scorn, etc." Spirit: The word translated here as spirit, ruh, comes from the same root as rahah. It is also related to rih, which means 'wind', mirwahah, meaning 'fan', and istirwah which means 'respiration'. The term "Spirit" translates the Hebrew word ruah, which, in its primary sense, means 'breath', 'air', 'wind'. Jesus indeed uses the sensory image of the wind to suggest to Nicodemus the transcendent newness of him who is personally God's breath, the divine Spirit." (Jn 3:5-8)" The words "vibrations" and "cool breeze" are used to imply the same meaning. For those wishing to comprehend the awesome reality and deep mysticism of Al-Qiyamah it is vital that these meanings are imbibed and remembered at all times. The Call of Allah to witness the Resurrection requires individuals to attest facts, statement, evidence; testimony. It may demand a person who bears witness to give a firsthand account of something or event, which in this case is about the Resurrection. A witness is called upon to observe an act, in order to testify concerning it if it is later held in question. The opening lines of surah Al-Qiyamah calls upon the Believers to witness the Resurrection! i) Why should Allah call upon the True Believers (Al-Mu'minun) to witness the Resurrection if heavens are rent asunder in wrath? v) Why should they observe the Resurrection - as if to confirm over time that indeed it is a command from Allah - if it is the apocalyptic End? vii) And if it is all about death and destruction what will the Believers of the Resurrection witness that others are also seeing in utter terror, a common experience for all humanity? - or is it that the vast humanity in general is completely unaware that the Day of Resurrection is taking place? viii) Why should His Spirit reproach the individual self of humans during the Resurrection if it is the dreaded End? ix) How will the Spirit reproach the individual self of humans during Qiyamah while millions shriek and quiver in fear and utter paranoia? x) What will be the language of communication - Arabic, Latin, English, French, Mandarin, or none of the above? xi) Who's going to be subject to this self-reproaching Spirit - the Muslim Ummah, the Jewish 'chosen ones,' the Roman Catholics, or all of humankind? Sure none of the theologians, clerics, imams, ulema, shaikhs, mullahs, and ayatollahs have any clue. Qiyamah is nothing but the long awaited promise of Resurrection, the Night of Power and Predestination (Al Qadr). This Age of Qiyamah is set to run for an unspecified period during which all humans will be granted the freedom to become the eternal spirit and enter paradise. "If you enter Paradise, you will live a very happy life without sickness, pain, sadness, or death; God will be pleased with you; and you will live there forever. God has said in the Quran: But those who believe and do good deeds, We will admit them to gardens (Paradise) in which rivers flow, lasting in them forever." (The Holy Qur'an, 4:57). The Prophet Muhammad told us that a "space in Paradise equivalent to the size of a foot would be better than the world and what is in it." He also said: "In Paradise there are things which no eye has seen, no ear has heard, and no human mind has thought of." Paradise is something that man on earth cannot apprehend. Every human being who inhabited this Earth since time immemorial will take his or her birth again ("come out of their graves") and will be informed that Resurrection has commenced. They have complete freedom to accept or deny His Offer. Those who accept will have their Self-Realization from within - "be baptized by Allah," have "Kundalini awakening," "be born of the spirit," "have their second birth," or "be born again" from within. They will then begin the jihad or inner cleansing that is so vital to enter Paradise. Jihad is overcoming the forces of evil by the forces of good. This purification will be accomplished without any external dependence on any religious organization for the self-reproaching Spirit of Allah will guide. Almighty Allah, the Infinite Intelligence, placed the evolutionary process within humans to be triggered by His self-reproaching Spirit within every human at the Hour of Resurrection. All religious organizations and their guardians have absolutely no say during Qiyamah - it is an individual journey to be confirmed by all the True Believers (Al-Mu'minun) with their own heart, mind and soul. Every human being who believes in Allah and the Day of Judgment must use his or her own mental faculties to determine if the Call of Qiyamah is indeed true, and not depend on any imam, mullah, pir, ayatollah, pope, priest, rabbi, monk, lama, swami, acaryas, brahmin, or pandit to decide for them. Regardless of all that has been revealed, the Resurrection will be rejected by all religious regimes. The mullahs will continue telling the Muslims to continue prostrating and praying to reach paradise and claim that Qiyamah is the End Time. The priests will continue sprinkling water on their heads of Christians to give 'second birth' and terrify them that Resurrection is the Wrath of God. The brahmins will continue chanting to the Hindus to achieve liberation and claim that Hindus are not subject to 'foreign gods.' The monks will continue advising the Buddhists to meditate for release from samsara and deny that Resurrection is a Reality. All religious Idols will cling to power and refuse to let their herd free. They will reject the Message of Allah and all His Ayat (proofs, evidences, verses, lessons, signs, and revelations), and battle for the souls of humankind which pitches the True Believers against the Unbelievers disputing the Good News of Resurrection. What is written must surely come to pass. But His Spirit will guide the True Believers (Al-Mu'minun) after Self-Realization. They will realize His Spirit within them and will experience the actualization of the Baptism of Allah within for the first time in their lives. They will know with heart, mind and soul that there is a transformation taking place within. And who can baptise better than Allah? And it is He whom we worship. Only those receiving the Baptism of Allah will know the Glory and Splendor of Allah's Self-reproaching Spirit during His Night Of Power and Fate (The Holy Qur'an, 97:1-5 Al Qadr)! The Qur'an declares that "Mankind is a single nation" (The Holy Qur'an, 2:213). These verses illustrate the breadth of the Muslim faith which urge not only love and respect for the founders of the great religions of the world, but much more than that – faith in them. The teachings goes beyond mere religious tolerance. It preaches equal love, equal respect, and equal faith in all. Islam is thus the greatest unifying force that forms the basis of human civilization - not the civilization of one nation or one country, but of humanity as a whole. Qiyamah is the Golden Age of Islam that will compel all humankind to surrender to the Will and Mercy of Allah. Islam, which means "to submit to the will of God Almighty", will become the greatest unifying force that will form the basis of human civilization and brotherhood. However, only those who have experienced the inner transformation after surrendering to Allah's Call to begin the Resurrection can truly understand what they can offer humanity. Given below are the experiences of (i) Jammy Akhbar (Algeria) who, after experiencing the Baptism of Allah, confirms that it is "the actualisation of the Resurrection promised by Islam and by all the major religions", and (ii) Javed Khan (India) who boldly declares that it is "the Qiyamat, the time of the Final Judgment." "A personal experience of Self-Realisation I wish to share with my compatriots. Thanks for creating a world forum to allow those of us who live so far away from home to express our deep concern for our country and perhaps make a useful contribution to the debate around our country's future. I have to admit that not a single day goes by without feeling a sense of frustration at not being able to do something for my country which will improve its social, economic and political status. Moreover every Algerian that I meet abroad feels powerless to do anything which could bring happiness, well being and security to a country which has been torn by years of dictatorship, violence and economic hardship. Instead of brooding on my frustration, I thought I might share my personal experience with my compatriots. Naturally I was born a Muslim but I was also a seeker of truth. I liked the idea of believing in God but I had to admit that it was just blind faith because no matter how much I prayed, fasted and gone through all sorts of penances I never managed to communicate with God let alone see Him. Everything I learned in Islam came from my family, my society and ancestors. I can't blame anyone for having forced me to accept a set of rituals and beliefs given that nobody knew any better and it was just everyone's desire to do their best to raise pious, obedient, religious children. This is the way my parents were brought up and so were their ancestors. In addition I was told that since I was born in Algeria, I was most likely to be Sunni which I later came to know as an orthodox form of Islam where communication with the divine or through a saint or some other religious institution was out of question. Gradually I discovered that Islam had split into several groups which had different ways of approaching the divine, the major ones being Sunni, Chia and sufism (as a mystical branch of Chia Islam). In my quest for truth I began to sense that there must be a way as promised by the prophet (pbuh) of knowing oneself (the Rouh or inner being) and thereby knowing the divine with all its science, knowledge joy and self fulfilment. So one day, I was extremely fortunate to meet a very great lady, Her Holiness Shri Mataji Nirmala Devi, who was not just a saint but who had the unique power of giving en-masse self realisation. This experience consisted of having one's inner dormant power, called Kundalini which is located in the sacrum bone area, awakened and rising along the spine until it pierces the fontanel bone area. As a result the recipient feels cool vibrations on his hands and on top of the head. Shri Mataji spoke like a Mother and with compassion, taught me and thousands of people all over the world, that this connection is the actualisation of the Resurrection promised by Islam and by all the major religions. She added that when you get this enlightenment you become a much better Muslim because you don't need blind faith anymore, you can feel God and his divine powers on your fingertips and within yourself, something which has never happened en-masse in the times of previous Incarnations. Once you feel these vibrations you become Sahaj which means spontaneous (thus the name of the discipline: Sahaja Yoga).In my quest for truth I began to sense that there must be a way as promised by the prophet (pbuh) of knowing oneself (the Rouh or inner being) and thereby knowing the divine with all its science, knowledge joy and self fulfilment. So one day, I was extremely fortunate to meet a very great lady, Her Holiness Shri Mataji Nirmala Devi, who was not just a saint but who had the unique power of giving en-masse self realisation. This experience consisted of having one's inner dormant power, called Kundalini which is located in the sacrum bone area, awakened and rising along the spine until it pierces the fontanel bone area. As a result the recipient feels cool vibrations on his hands and on top of the head. Shri Mataji spoke like a Mother and with compassion, taught me and thousands of people all over the world, that this connection is the actualisation of the Resurrection promised by Islam and by all the major religions. She added that when you get this enlightenment you become a much better Muslim because you don't need blind faith anymore, you can feel God and his divine powers on your fingertips and within yourself, something which has never happened en-masse in the times of previous Incarnations. Once you feel these vibrations you become Sahaj which means spontaneous (thus the name of the discipline: Sahaja Yoga). During the time of the Prophet (pbuh), self-realisation was only enjoyed by those closest to him while the great majority could never understand what he meant by self-knowledge. However in the Koran He promised that one day your hands will speak and your feet will testify against you. This is exactly what happened when I felt vibrations, as an enlightened Muslim I could feel which part of my inner being was alright and which was affected with a problem and then I could clear my energy centres (known in Koran as the seven skies or Sabaa Samawat), improve my connection with reality and feel the infinite compassion and joy of the Almighty flowing through me. During the time of the Prophet (pbuh), self-realisation was only enjoyed by those closest to him while the great majority could never understand what he meant by self-knowledge. However in the Koran He promised that one day your hands will speak and your feet will testify against you. This is exactly what happened when I felt vibrations, as an enlightened Muslim I could feel which part of my inner being was alright and which was affected with a problem and then I could clear my energy centres (known in Koran as the seven skies or Sabaa Samawat), improve my connection with reality and feel the infinite compassion and joy of the Almighty flowing through me. Prior to giving any more details about this extraordinary experience, I have to prove that this is not just a hypothesis but a genuine happening which can be enjoyed by every aspiring seeker. The easiest way of trying the experience of self-realization is to put your hands, with palms upwards, towards a photograph of Shri Mataji and observe what you feel on your fingers, hands and eventually on top of your head. To begin with, you may just feel tingling and heat but gradually, the heat will dissolve and you will feel a cool breeze flowing on your hands and on top of your head. Even if you don't have a photograph just putting your attention on H.H. Shri Mataji with the palms upwards is sufficient to start feeling cool vibrations on your hands. If I had to describe all the blessings Sahaja yoga has bestowed on thousands of people, all over the world, I would need to write a pile of books. This is just a very humble introduction to the most powerful breakthrough in human evolution. Finally I have to come back to talking about my country only to say that my dream is that someday many thousands of Algerians will get their self-realisation and will attract the blessings of the divine to establish peace, prosperity and complete satisfaction." "THAT DAY SHALL WE SET A SEAL ON THEIR MOUTHS BUT THEIR HANDS WILL SPEAK TO US, AND THEIR FEET BEAR WITNESS TO ALL THAT THEY DID." Here again it is very clear, once the ascent or realization takes place, a person's hands and feet start to speak, bearing witness against him. Not only the hands and feet but the whole body starts to speak. All of the rights and the wrongs that have been done or are being done are known through the vibrations being emitted from the body. Thus, on the vibratory level, everything is known, not only about yourself but also about others. After realization these vibrations are distinctly felt on the hands and feet as a cool breeze flowing from within. A person also gets to know when he is being lied to, or being manipulated. The mouth stops speaking for the realized person, as the mouth can lie but the hands start speaking and the feet bear witness, as everything is revealed through the vibrations and the vibrations never lie. This is the time of Qiyamat without a doubt as all the prophecies in the Quran and the Hadith are coming true. The experience of Self-realization, ascent and meraj are not just happening to a few but thousands and thousands of people throughout the world are experiencing it en masse through Sahaja Yoga. The Muslim community is generally highly programmed and conditioned. It therefore does not look beyond what has been taught to them by the Mullahs, who themselves, unfortunately, do not have much foresight and insight. The Sufis, however, discovered the true essence of Islam and sought their self-realization and God-realization. They saw the All Pervading and His love everywhere and in everything. The Sufis always kept seeking and searching for God. They knew that this was possible after they had attained their own Meraj. . . .
Now for the first time in human history, in the presence of H.H. Mataji Nirmala Devi, thousands of people are experiencing this great phenomenon en masse, through the simple process of Sahaja Yoga. Her authority and identity, along with the truth of all that is written above, can only be confirmed after one experiences the awakening of Kundalini (Buraq) and gets self-realization (Meraj). When the Kundalini passes through Chakras and when the seventh Chakra, the Sahasrara, is opened, a person achieves connection with the Divine. This is the Qiyamat, the time of the Final Judgment. This is the time the Prophet told the world about. It is just the matter of recognizing it and ascending within oneself and through the seven heavens." Note: Shri Mataji Nirmala Devi was born on March 21, 1923 to a Christian family in Chindawara, India and then married into a Hindu family. Her father was a renowned scholar and master of 14 languages who translated the Qur'an in Marathi. Now She is explaining the living, breathing Qur'an to all the Believers of God Almighty. May the wise and visionary see far into the future to envision the matchless ingenuity of Allah's (SWT) Plan for humanity, one that will be harmoniously and willingly embraced by all irrespective of their religious background. All humans - Hindus, Buddhists, Jews, Christians, Muslims, Sikhs - are now reminded to confirm this promised Tiding of the Qur'an! That is why while writing about Al-Qiyamah care has been taken to avoid as much confusion as possible among non-Muslims. The articles are written with a non-Muslim audience also in mind. Consequently, English terms and figures familiar to non-Muslims are used. For example, "Jesus" is used instead of "Isa" and "John" in place of "Yahya". Also terms of respectability commonly used among Muslims such as SWT, PBUH, SAWS, RA, and AS were avoided. Apologies are offered if anyone is offended. "5889. Great News: usually understood to mean the News or Message of the Resurrection." Abdullah Yusuf Ali, The Holy Qur'an, Amana Corporation, 1989. This surah has been named al-Naba’, and also Amma, on account of the prominence within it of the words al-naba’, meaning ‘the announcement’, and amma, meaning ‘about what’. While the previous surah (al-Mursalat) concluded by mentioning the resurrection and by warning those who deny it, this surah opens on the same theme." "The Surah derived its name from the word an-Naba in the second verse. This is not only a name but also a title of its subject matter, for Naba implies the news of Resurrection and Hereafter and the whole Surah is devoted to the same theme." "The Surah is entitled Al-Naba' because it deals with subjects of exceptional importance i.e., certainty of Resurrection, predominance of the Qur'an over all other revealed Scriptures, and of Islam over all other Faiths. The Day of Decision, i.e., the day when this Quranic claim will become an established fact, is mentioned twice in the preceding Surah and is repeated here. According to Muslim Commentators the Surah was revealed very early in the Holy Prophet's ministry at Mecca. Noldeke agrees with this Muslim scholarly opinion. It opens with enumerating the great Divine gifts bestowed upon man, and directs his attention to the implied suggestions that he has been placed upon this earth to serve a certain object and his life here is the seed-bed of an eternal future and it will be followed by a Day of Reckoning. The Surah then gives a brief but an awe-inspiring picture of that Day, and a graphic description of the heavenly blessings that await the righteous and of the terrible punishment which will be meted out to the rejectors of Truth in this life and in the next." This Sura is entitled Al-Naba' (news of tremendous importance or great Event), because it deals with a subject of exceptional importance ie, certainty of the Resurrection." In Abdullah Yusuf Ali's commentary Kufr, Kafara, Kafir, and derivative forms of the word imply a deliberate rejection of faith, revelation and truth of the Holy Qur'an: "The culmination of Allah's Revelation is in the Qur'an, which confirms previous scriptures, corrects the errors which men introduced into them, and explains many points in detail for all who seek right worship and service to Allah"whether they inherit the previous Books or not. It is a universal Message ... The worst and most hardened sinner is the man to whom Allah's Signs are actually brought home and who yet prefers Evil and turns away from the Light of Allah. The Signs may be in the words and guidance of a great Teacher or in some sorrow or warning, but from which he deliberately refuses to profit. The penalty"the Nemesis"must necessary come eventually." According to Ibn Taymiyah (1263 – 1328) "kufr is the attribute of everyone who rejects something that God has commanded us to believe in, after news of that has reached him, whether he rejects it in his heart without uttering it, or he speaks those words of rejection without believing it in his heart, or he does both; or he does an action which is described in the texts as putting one beyond the pale of faith." Thus kaffir (non-believer) here is applied to all humankind, both Muslim and non-Muslim, who reject the Call that God has commanded us to believe in after His Revelations, Signs and Warnings have reached us. The Qur'an clearly warns that many will disbelief, even mock, the Great News and Sure Signs of Al-Qiyamah. The last paragraph is yet another warning from Allah (SWT) that prior to the Wrath of the End (Al Qariah) humans are offered the Mercy of the Resurrection (Al Qadr). And once the Hour of Al Qariah comes to them, how will they benefit from their contemporary message of Al Qadr i.e., from the Great News of the messengers from amongst you? How will those reading these lines benefit if they continue to doubt and wait, and the Striking Day comes suddenly? What use then will be the Mercy and Compassion of Al Qadr (Night of Destiny) if the morn of the Al Qariah (Striking Day) ends His Peace? Why doesn't the Ummah then not study the Quran with painstaking effort to avoid the errors, mistranslation and ignorance of the ulema that have presently paralyzed their minds from believing the Great News? Why don't they use their own mental faculties and intelligence to understand Al- Qiyamah, the heart and soul of the living, breathing Quran? Living and breathing because God Almighty is now talking directly to you through His Holy Book! After all, it is Allah (SWT) who has now called out to all Believers with this Decree: "I do call to witness the Resurrection Day; And I do call to witness the self-reproaching Spirit." He is specifically addressing you in particular (and Believers is general) to do so! Only now in this modern age of universal education, mass media and publishing technology"after 14 centuries and unlike the illiterate past"is it possible to own and be sufficiently literate to "study the Quran carefully" in languages they understand best. * And just in case the Believers start studying the entire Qur'an, it must be stressed that Allah (SWT) is referring specifically to those eschatological Signs and surahs upholding His Call to bear witness of the Resurrection! They must thoroughly examine and understand the Signs that have already manifested, and set forth by messengers from amongst themselves. "There is so much blind faith, there is so much of wrong ideas, so much of organizational fortresses they have built. All kinds of nonsensical things are going on in this world, but they'll all be finished." "We are now in the Blossom Time, as I call it, because many flowers are born and they are to become the fruits. This is the Resurrection Time, which is described in all the scriptures. But it’s not like this, the way they had described us. Something wrong with them that all the dead bodies who are in the graves will come out of the graves. I mean, how much is left out of them, God knows. Must be some bones or maybe some skulls there. So they’ll come out of the graves and they will get their Resurrection!!!? This is a very wrong idea. Once I happened to meet a fellow, a Muslim from Bosnia and he told Me, "I want to die for my religion, for God’s sake." I said, "But why? Who told you to die?" He said, "Now, if I die in the name of God, I’ll be resurrected." I said, "It’s all wrong. That’s not the way it is going to work out. Resurrection is going to work out this way that at this time, all these souls will take their birth. All these souls will take their birth and they will be resurrected. As human beings they’ll have to come." That’s why we find all kinds of funny people these days, all kinds of cruel, criminal, all kinds of idiotic, stupid, I mean very queer, weird, funny ideas which find such, such a variety of people and such a tremendous population that we should understand they have to have their chance of Resurrection. But how many will come? That’s the point. How many are going to come?" "I should do something to bring sense to these people (humanity). Something should happen to them otherwise what I see is a complete disaster. It is going to happen. I do not want to frighten you like Mrs Thatcher does about the Russians. That might be imaginary. But this is real. I am warning you that the Disaster is going to come as destruction itself." "I have such respect for so many of them (Muslims). I wish they could accept that this is not Jihad time anymore but Qiyamah Time, the Resurrection Time, the Blossom Time. Are they going to miss it?" " "If your mother tongue is not Arabic, Satan (or his troops) will encourage you to read the Quran in Arabic. Why does he do that? Because he knows that you will not understand enough of it. The majority of those who learn Arabic to study the Quran do not excel enough to understand the implication or interpretation of certain words when used in a special way in the Arabic language. They will have a lot of shortcomings. Many Pakistani and Indian Muslims are forced as children to read the Quran in Arabic and still as adults read the Quran in Arabic but they do not understand a single word of what they read... The Quran is a message, not just another beautiful language book. If you cannot read it in Arabic do not wait until the day you excel in your Arabic language, because this day may never come. Trust God and know that He is the teacher of the Quran. He will teach in any language and to any nationality, He created all things. Read your Quran today, (do not wait any longer,) in any language that you can understand and master and leave the rest to God." Dr. Rashad Khalifa, Ph.d.
"Of course there are some absurd things which grew with misinterpretation and interference from unholy people, which are common in these religions. For example, Jews, Christian and Muslims believe that when they die their bodies will come out of their graves and they will all be resurrected at the Time of Resurrection, at the Time of Last Judgment, at the Time of Qiyamah. It is illogical to think what will remain inside those graves after five hundred years. Nobody wants to think and understand that it is not the body but the soul that will come out of these bodies, be born again as human beings and be saved through Qiyamah and Resurrection." "But the Muslims do not want to talk about Resurrection at all because they want to frighten people with the Doomsday. They don't want to talk about the Resurrection Time which is going to come - which is the intermediary time - because they want to use the time which will frighten people by saying that: "Now your Doomsday is coming! Now your Doomsday is coming!" Everyone is frightened about God and they think, "Now we should just wait for our doom. Nothing at all in between." "
"I hope all of you will get your realization tonight. It is your freedom, I respect. If you don't want to have your realization, you may go. I cannot force on you. As I told you this is the Last Judgment. Mohammed Sahib has said: "When Qiyamah will come", means when the Resurrection time will come then "your hands will speak", "they will give evidence against you", means they will tell you what centers are wrong in you." So this process is only for ten minutes that you will feel this Cool Breeze but those who do not want should leave the hall. "Muhammad Sahib has written very clearly that "when your Resurrection will take place then 'your hands will speak', and will give witness against you." That is what that they will tell you what's wrong with you. Your hands will tell clearly and that to know the Truth you will feel it in the palm here (center of palm.) When you ask the question to the real One you will get your answer here (center of palm.) All these things can only happen in Sahaja Yoga - in no other way. Whether you are a Christian, Hindu, Muslim or Jew we have to know that we have to still step one step forward." "The Noble Qur'an makes it clear that the testimony given by sinners in the court of divine justice will be utterly unique in nature, bearing absolutely no similarity to the juridical procedures of this world. The verses of the Qur'an that speak of the giving of testimony on the day of resurrection proclaim that the hands, feet and even the skin of the sinners will disclose the hidden sins that they committed during their lives and that were previously unknown to all but God; the sinner will stand revealed, to his utter dismay and terror. The animation of these witnesses and the testimony they will bear to the events that have happened in the world show that all the deeds we perform are recorded both in the external world and in the various organs and limbs of our bodies. When the conditions of this world are replaced by those of the hereafter, on the day when, as the Qur'an puts it, "secrets are made manifest and none will be able to conceal anything or seek help from anyone." (86:9-10) all the deeds that have been recorded will pour forth and begin to bear witness. We can indeed observe in this world a pale and feeble example of what is meant by things acquiring speech. A doctor, for example, understands the language of the body. The rate of the pulse may indicate fever, and yellowness of the eye proclaims the presence of jaundice. To give another example, we can tell the age of a tree from the circles within its trunk. It is nonetheless true that we cannot know the exact modality of the testimony that will be given in the hereafter. However, once the veil is lifted from men's sight, their power of vision will increase and their level of perception will be raised. They will embark on a new life with enhanced means of perception and will see many things that surrounded them in this world although they were unaware of them. Thus the Qur'an says: "You were in a state of negligence; now We have lifted the veil from you so that your sight is today keen." (50:22). "Let them fear a day on which their tongues, their hands and their feet shall bear testimony against them." (24:24). "A day on which all the enemies of God will be drawn into the fire as they stand next to their destined abode, their ears, their eyes and the skin on their bodies shall testify to the sins they have committed. They will address their limbs in astonishment, saying, `How do you testify concerning our deeds' They will answer, `God who gave speech to all creatures has also given us speech. First He created you, and now He brings you back to Him. You concealed your ugly deeds not in order that your ears, eyes and skins should not give witness today, but because you imagined God unaware of what you hid from other men. It is this groundless assumption that has brought about your perdition, for today you are in the ranks of the losers." (41:19-23). This verse stresses that man is unable, in the last resort, to conceal the sins he has committed with his limbs. This is not because he under estimates his bodily form, which in the end turns out to have been a means for recording his deeds, but because he imagines that things are essentially autonomous and that much of what he has done will be beyond the reach of God's knowledge. It is this unawareness of the fact that nothing in creation is hidden to God that casts men into the pit of eternal wretchedness. "Today We place the seal of silence on the mouths of the unbelievers and transgressors. Their hands shall speak to us, and their feet shall bear witness to what they have done." (36:65). Even more remarkable is the fact that the deeds man has performed will themselves take shape before his astonished eyes. This must definitely be regarded as the most veracious form of testimony possible; it closes off before the offender any defense, deception or flight from chastisement, and strips him of denial and sophistry. No crime remain unproven, and the sinners will be overtaken by shame and humiliation. "On the day of resurrection they will find whatever they have done confronting them." (18:49). "There will be a day on which everyone who has done a good deed will find it confronting him, and those who have done evil will wish that it were kept far distant from them. God warns you against His punishment for He is in truth compassionate toward His servants" (3:30). Since it is impossible for deeds to disappear in the hereafter, the most that sinners can hope for is that a distance be maintained between them and their deeds, a clear expression of their disgust with what they them selves have done. All of our words and deeds are stored in the vast and mysterious archive of our body and our soul, and they will be brought forth in the tribunal of resurrection. The totality of our acts, good and bad, are stored up within us and will ultimately take shape to confront us. The reckoning of men's deeds that will take place in the hereafter will, then, be utterly unique. No one may hope to obfuscate the truth or to deny the contents of the precise record that is laid before him. Everyone will be compelled to accept the truth and to submit to its consequences. The hands, the feet and the skin will be called on to give witness; God from Whose knowledge not at single atom in the heavens and earth is hidden and Who is aware of the falling of leaf from a tree, will also be a witness; and the prophets and the Imams will bear their witness to whatever we have wrought. It is obvious that it is impossible for us now to understand and perceive fully all these dimensions of the inevitable reckoning that will follow resurrection." "Malamatiyah, a Sufi (Muslim mystic) group that flourished in Samanid Iran during the 8th century. . . . often referred to the Qur'anic verse "I [God] swear by the reproachful soul" as the basis for their philosophy. This verse, they said, clearly praised a self that constantly reproached and blamed its owner for the slightest deviation from the world of God. The reproachful self in Malamati terminology was the perfect self." "It is not often that "saffron" [of Hinduism] meets "green" [of Islam] in post-Godhra Gujarat, however two religious scholars took on the task at a seminar on peace organized by the Lion's Club and Idara Khidmate Khalk. Islamic scholar and theologian, Maulana K. R. Sajjad Nomani said a majority of Muslims do not know what their religion stands for. "Muslims themselves have misinterpreted Islam and its practices. A modern and scientific religion is today looked upon as the refuge of fanatics. The Muslim community has to do serious introspection and educate their fellowmen on the true essence of Islam," Nomani said. He appealed to Hindus not to believe the wrong notions about Islam. "Just because somebody says that Islam is a religion of fundamentalists, don't believe it. Find out for yourself before making a judgement," he said." It has been more than half a century since the first appearance of 'Abdullah Yusuf 'Ali's superlative work, The Holy Qur’an: Text, Translation and Commentary. Since that time, there have been innumerable reprinting and millions of copies distributed throughout the world. 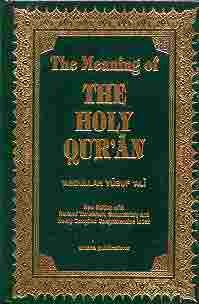 It is, by far, the best known, most studied, and most respected English translation of the Qur'an. It was the first monumental and authoritative work of its kind and it subsequently inspired many such similar endeavors. The eloquent poetic style of the translation and the authenticity of the extensive commentaries and explanatory notes, have, no doubt, contributed greatly to its much deserved reputation as the English translation of the meaning of the Qur'an. The tremendous impact that this work has made upon the English-reading Muslims (as well as, many non-Muslims) of the world, has never been greater than it is today and shall continue-insha'a Allah (Allah willing)-for generations to come. It has enabled interested readers of English, who do not have a proficiency in reading and comprehending Qur'anic Arabic, to greatly enrich their understanding of the meaning and the incomparable beauty and perfection of the Glorious Qur'an. It has given them a more authentic and reliable translation and commentary from which they could make a serious study. 2. "Ali's footnotes are admittedly one-sided; they are written from an explicitly Muslim perspective, rather than a neutral or interfaith standpoint. Still, the footnotes are often very informative, even fascinating, as he puts passages in context and discusses theological and linguistic points.